TXORI Ornithological Foundation is a non-profit civic organization founded in 1986 by engineer Candido Busteros Garcia with the aim of preserving Mexican endangered birds. 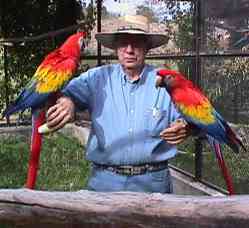 Being aware that deforestation and wild bird trade had became a serious threat to many Mexican species, in 1989 Busteros acquired animals in captivity - some of them in really poor conditions, to install them in an aviary at his home garden which he had previously adapted and prepared as a spacious and comfortable refuge. The first foundation projects were aimed at the rescue of members of the Corvidae and Ramphastidae families. Due to the alarming loss rate of forests and rainforests in Mexico, Busteros decided to introduce macaws, parrots and parakeets (Psittacidae family). Years of observing and analyzing the behavior of captive animals yielded a lot of information and significant results. The major achievement was that birds were kept not only healthy but happy, however. 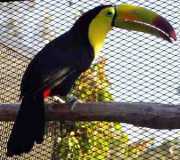 This was confirmed when by accident many of them escaped from the aviary and returned shortly after by themselves. 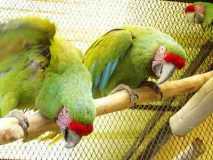 The first TXORI chicks were born at the beginning of 1995, and this happy event motivated the construction of a larger aviary dedicated to Parrots. 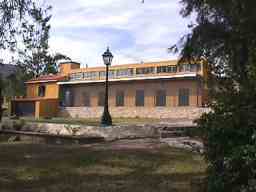 In 1996, Txory acquired under a gratuitous loan agreement a country lot where the construction of the TXORI II aviary began in 2001 and, after several stages, was completed in July of 2008. Regardless of its small size, TXORI II is a model aviary that includes 20 dwelling spaces, 10 of which are for breeding couples; a hospital, maternity ward, storerooms for food and implements, cabin for the care providers, orchard, nursery and compost device. TXORI II is equipped with incubator, hatchery, breeders, closed-circuit TV in the nests, solar panel for power generation, and waste water treatment plant. TXORI Ornithological Foundation is currently raising the amount of money required to buy a larger piece of land in a region that is environmentally suitable for building the TXORI Sanctuary, a natural reserve where the chicks born in the aviaries may return to the wilderness. The TXORI Sanctuary is conceived as a refuge that besides the reproduction, socialization and recue-center aviaries includes an area where birds can live in a semi-wild state. All this under a close supervision and control that secure the survival of the individuals freed. Mexico is home to 22 species of the Psittacidae family, 21 out of which are listed as species under some degree of conservation danger due to increasing deforestation and unstoppable illegal bird trade. Notwithstanding the foregoing and its renowned ecologic and cultural relevance, Mexico has very little and insufficient information about the biological, geographical and socio-economic conditions required to developing an action plan to secure the conservation of wild parrots, parakeets and macaws. In this context, encouraging research programs is a must to provide the basis for the implementation of comprehensive conservation projects that will include both the members of the Psittacidae species and their habitats. Also, public policies must be pushed by the citizenship to reinforce the legal protection of birds and their increasingly pillaged ecosystems. Preserving Mexican endangered birds through reproduction in captivity and reinsertion to the wilderness of chicks born in aviaries. a). Promoting respect for birds and their ecosystems. b). Encourage research of endangered species. c). Developing effective techniques to handle birds in captivity and allow to the reproduction of specimens of species in danger of extinction. d). Developing conservation programs based on the reproduction of captive specimens and the reinsertion of chicks in natural sanctuaries with monitoring and protection. e). Keeping the community informed on the conservation status of endangered Mexican birds, mayor conservation threats and solutions. f). Spreading and promoting a culture of sustainable management of natural resources. g). Encouraging and taking part in ecology projects aiming not only at scientific research, environmental education, healthy relaxation, species and ecosystem conservation, but sustainable social development. h). Proposing the creation of new laws, regulations and public policies that contribute to increase bird and habitat protection.